It was hard to get my baking accomplished this weekend, but if I could go back and do it all again, I wouldn’t change a thing. I just spent the weekend with 8 of the sweetest 6th graders on the planet. My church holds a youth conference each year called Disciple Now. Students travel to the homes of generous church members to spend two days worshiping God, studying His Word, and having fun. I was a family group leader, responsible for leading the gals through Bible studies and refereeing the occasional pillow fight. My short time with those bright, silly, beautiful, brilliant young ladies was so rewarding — partly because at first, it didn’t feel like it was going very well. They were exhausted Friday when we arrived home after worship, and were in no state for the Bible study we had planned. Sleepiness, pointed watch-checking, and delirium ensued. I lay in bed that night and reiterated the prayer I’d prayed upon arriving at the event earlier in the afternoon: Lord, I know Your strength is made perfect in my weakness, and right now, I’m feeling very weak! Please come make this work for Your glory. The next day, I spoke with other group leaders who had experienced that very same moment of brokenness late Friday night. My Bible study leader revealed that she had woken up at 3 am that morning with the urge to pray for us. I’m so thankful for her prayers and the faithfulness of God — because the fantastic time spent with the girls Saturday was not my doing, but His! Apart from wheelbarrow relay races, crabwalking, screaming contests, an obstacle course, and a whole lot of giggling, we had an amazing discussion of what it means to live a “backwards life” for Christ (here is a site where you can download a free copy of the devotional book we worked through on this topic). The girls revealed their hearts — friends they were praying for, their struggles in faith. At one point, we made a list of daring ways to share the gospel (“good news”) of Christ with our loved ones. I’m adding one to my own personal list — posting the good news on Willow Bird Baking! You are all on my list of “loved ones”! You may not be a believer, but I challenge you to read and consider this message either way, in the spirit of allowing me to share something that’s important to my heart. The central message of Christianity is this simple truth: we are all sinners, separated from God by our sins. We cannot remedy this by ourselves, but God so loved us that He sent His Son Jesus to live a perfect life and die in our place — paying the price for sin. Jesus was then resurrected to triumph over sin and death. If we confess with our mouth and believe in our heart that Jesus did this for us, we accept His free gift of what Christians call “salvation”: salvation from the price of sin, and an eternal relationship with God, who is a wonderful Father. If this is the first time you’ve heard or understood what Christ did for you, will you take a moment right now and tell Him you’re accepting His gift? If you’re already a believer, will you take a moment and thank Him again? Lastly, if you’re reading this right now and have questions, please leave me a comment with your email address. 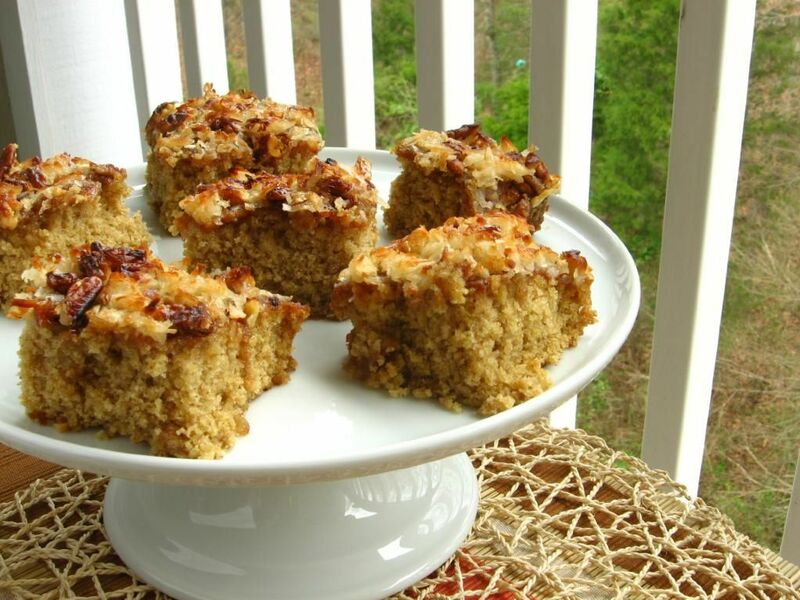 Okay, I know you’re ogling the pictures of the amazing Oatmeal Cake with Broiled Icing and wondering . 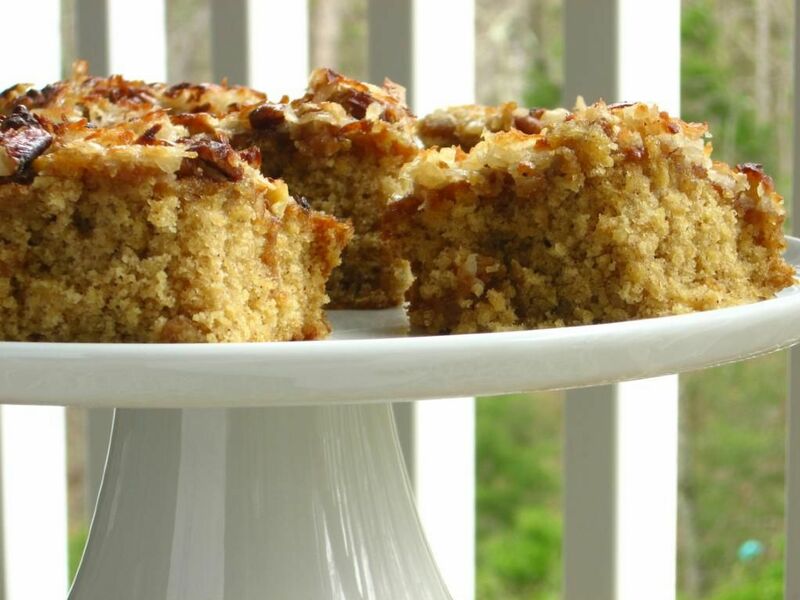 . . how does Christ relate to Oatmeal Cake? Well, my jam-packed weekend resulted in a rushed baking session on Sunday. I needed a quick and simple recipe that I could make while bleary due to sleep deprivation. I cut calories during the week to splurge on the weekends, so I also wanted a recipe that could be easily devoured before Monday morning. This cake more than fit the bill — especially the easily devoured part! 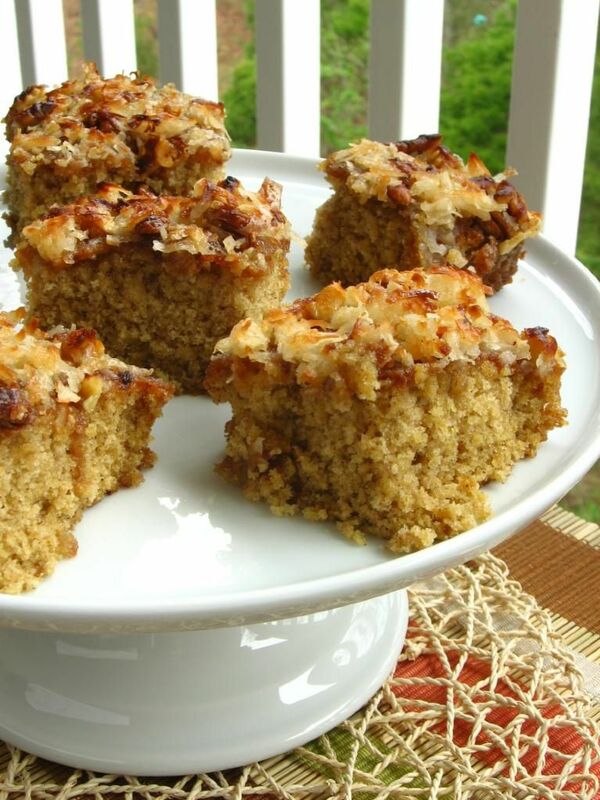 This recipe is heavenly, y’all (pun intended)! 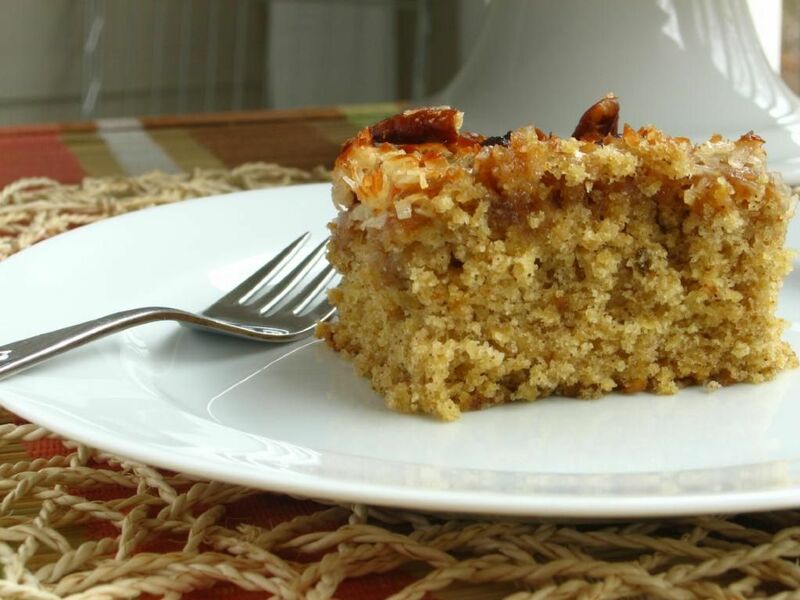 The cake is incredibly moist and delicate, with a mesmerizing blend of cinnamon, nutmeg, and oats. 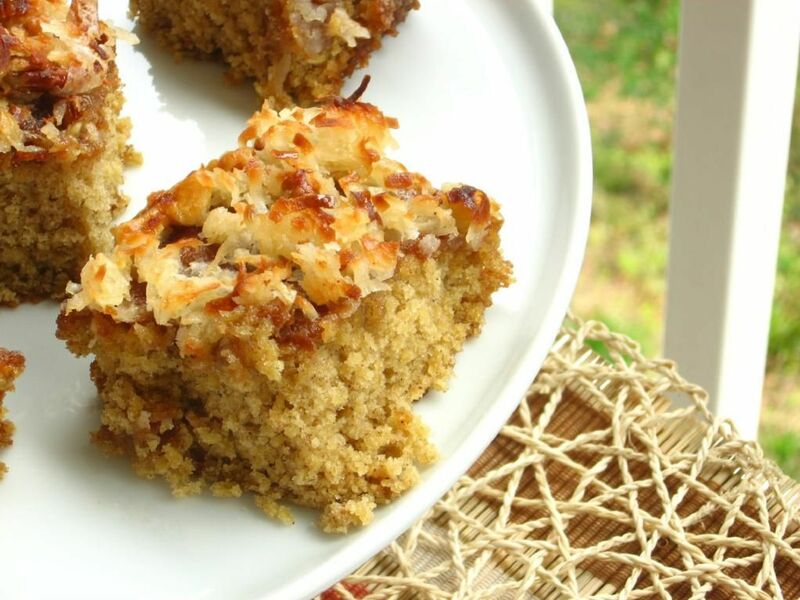 The broiled icing is insane: toasted coconut and pecans bound by a gooey almost-caramely mixture created by the broiled butter and brown sugar. On my Recipe Index, small hearts denote Willow Bird Baking favorites — the recipes I’m over the moon about. 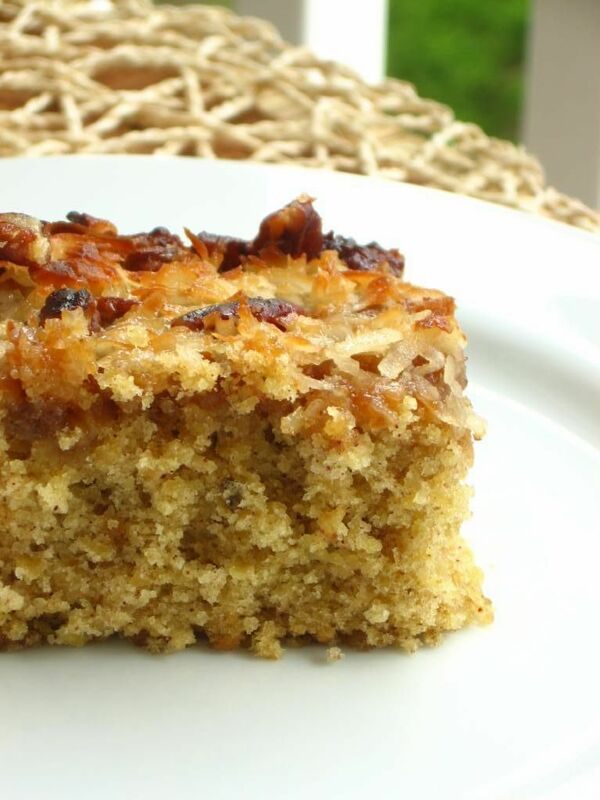 This hearty, filling cake has more than earned its heart! One of the best parts is that it truly is a quick and easy recipe as well. The icing is spread on while the cake is warm, meaning that the entire recipe can be easily accomplished within an hour (not including cooling time). If I got through the entire process without a hitch while half-asleep, caffeinated, sore, and frazzled, it should be a breeze for you! Happy eating! 1. FOR THE CAKE: Adjust oven rack to middle position and heat oven to 350 degrees. Cut two 16-inch lengths aluminum foil and fold both lengthwise to 5-inch widths. Spray 8- by 8-inch metal baking dish with nonstick cooking spray. Create a foil sling for the pan: cut two 16-inch lengths of foil and fold them to widths of 5 inches each. Fit foil pieces into baking dish, one overlapping the other, pushing them into corners and up sides of pan; allow excess to overhang pan edges. This creates a sling that will help you remove the cake after baking and cooling. Spray foil lightly with nonstick cooking spray. 2. Combine oats and water in medium bowl and let sit until water is absorbed, about 5 minutes. In another medium bowl, whisk flour, baking soda, baking powder, salt, cinnamon, and nutmeg together. 3. In bowl of standing mixer, beat butter and sugars on medium speed until combined and mixture has consistency of damp sand, 2 to 4 minutes, scraping down bowl with rubber spatula halfway through mixing. Add egg and vanilla; beat until combined, about 30 seconds. Add flour mixture in 2 additions and mix until just incorporated, about 30 seconds. Add soaked oats and mix until combined, about 15 seconds. 4. Give batter final stir with rubber spatula to make sure thoroughly combined. Transfer batter to prepared pan and lightly tap against counter 3 or 4 times to dislodge any large air bubbles; smooth surface with spatula. Bake cake until toothpick inserted into center comes out with few crumbs attached, 30 to 35 minutes (careful: mine only took 28 minutes), rotating pan halfway through baking. Let cake cool slightly in pan, at least 10 minutes. 5. FOR THE BROILED ICING: While cake cools, adjust oven rack about 9 inches from broiler element and heat broiler. In medium bowl, whisk brown sugar, melted butter, and milk together; stir in coconut and pecans. Spread mixture evenly over warm cake. Broil until topping is bubbling and golden, 3 to 5 minutes. 6. Let cake cool in pan 1 hour. Following illustration 2, transfer cake to serving platter, then discard foil. 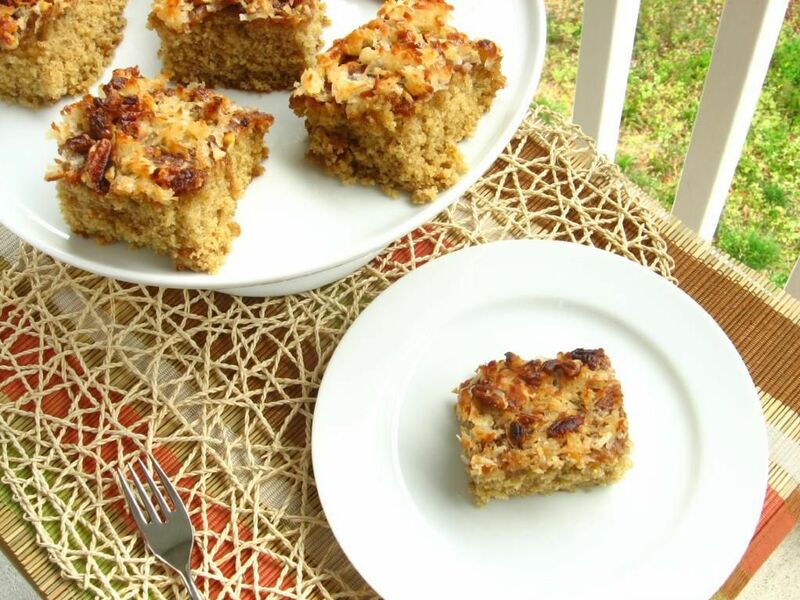 Cut cake into squares and serve. *ATK’s notes: Do not use old-fashioned or instant oats for this recipe. 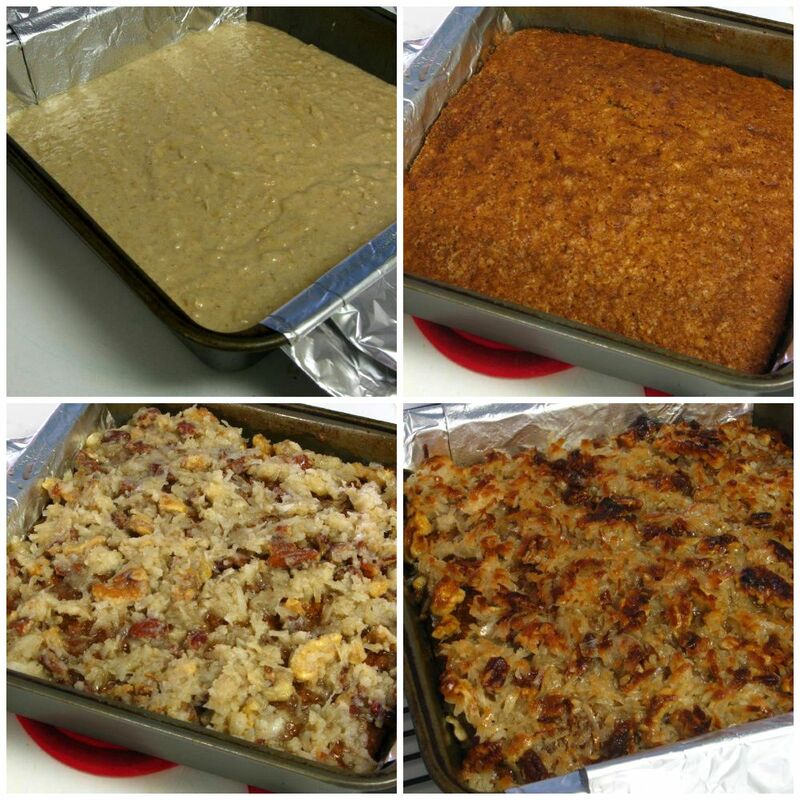 Be sure to use a metal baking dish; glass pans are not recommended when broiling. If you have a drawer-style broiler (underneath the oven), position the rack as far as possible from the broiler element and monitor the icing carefully as it cooks in step 5. 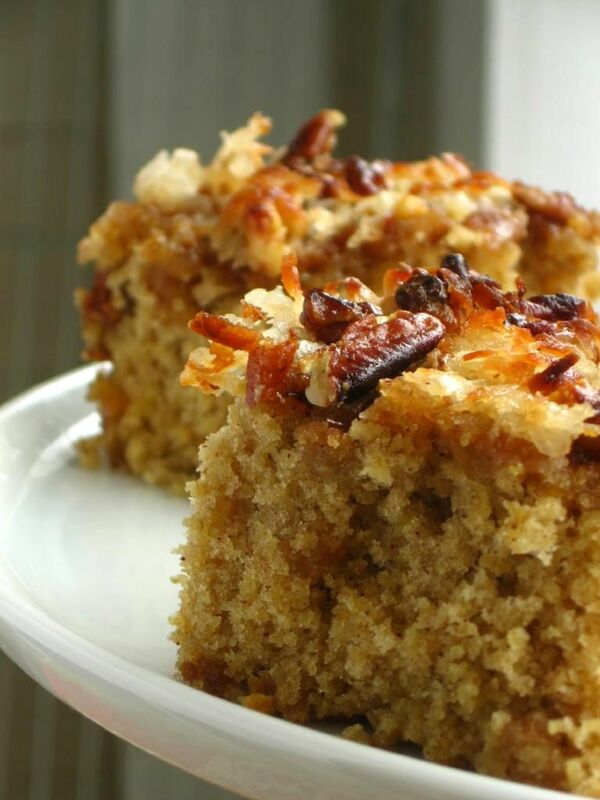 A vertical sawing motion with a serrated knife works best for cutting through the crunchy icing and tender crumb. P.S. Reader comment: “Seriously this is the best cake I have ever baked or eaten. […] I cannot thank you enough for posting this. It is seriously amazing!” Hurray! GO MAKE THIS CAKE! I hope you enjoy it, Gary, and I’m so glad your cancer is doing better! Julie I have been making this cake since I was 15 (1956) and my Aunt taught me to make it. We love it and I usually am asked to bring to carry-ins. Sounds like a great weekend. I am sure the girls heard every word. They will turn it over and the full effect will not be apparent for years. God promises that His word will NOT return void…so it did what He wanted it to do. You did your part as the messenger! Byrd, meanwhile, got dirtier in 5 minutes than Abbey manages to in 6 months! I laughed outloud when I saw her all dirty with a leaf hanging from one ear! She was looking at me like, “what??? !” She had fun in the yard, though. I make this cake but we like it with the old fashioned flour frosting (cooked milk & flour, cool and add shortening, butter, vanilla, etc. ) Since we no longer regularly eat flour (or sugar) maybe we should try a version like this again? Someday, when I lose my 6 #s!! It looks beautiful and is gone already at our house! She can be a total mess!! Did Alex like the cake? i am a Christian and ironically enough our sermon last Sunday was on sharing the Gospel. Thank you for using this outlet to reach others, such a blessing! I think he loved it, Julie! It is all gone. He has not eaten his cupcakes, yet, I think because they are out of sight (in the freezer)! Yes, I sent you photos of her but she looked much dirtier in person! I just noticed your cake stand. Where did you find that? I need a new one (with a cover). Mine cracked! You can get all 3 sizes for $70! You are such a blessing to those lucky girls! I attended similar conferences when I was their age, 35 years ago, give or take. I still remember them with fondness. What a great foundation for my teenage years! I’m sure those girls will feel the same way about the time they spent with you. That cake looks delicious! It’s one of my favorite cakes, too! Did you happen to see that PW posted some new book tour dates today? GUESS WHAT??? She’ll be in Charlotte on May 7 at 6 p.m. at Joseph-Beth Booksellers! So clear your calendar! I really hope you get to attend! My daughter and I had a great time! AHHHH I am so going to be there!! I’m going to need to make a PW t-shirt or something to stand out 🙂 How exciting!! Oh, good! Making a t-shirt is a GREAT idea! A few people did that at the one I attended and really stood out. Other people brought gifts for her. Handmade crafts, local edibles, that kind of thing. Her husband and sons were there. Adorable! Make sure you get there PLENTY early! In St. Louis, it was held in a cathedral, and by the time it started there was standing room only. I estimated 600 people there. So plan accordingly! We got there about an hour and a half early and got seats in the middle, give or take. And she gave t-shirts to everyone there. I was blown away by that. They are nice shirts, too. Not cheap ones. I just love her! I hope you take lots of pictures, I want to see them! I thought you might like to look at this…it’s the web site for the company PW used to make the t-shirts she gives away. I love their shirts! And their motto…get your verse on. So cute! Oh, I will take tons of photos! My mom and dad and I are already planning on making an evening of it. Thanks for your tips — they will definitely come in handy!! PS — How awesome re: Wild Olive t-shirts! They look like a great company. So, is this from the ATK family cookbook, or the baking book? My mom and aunt both have the family cookbook, but I’ve never gotten to look at the baking book. We should, Mom! Let’s make t-shirts and get there early! Dad says he will come with us and we can eat out, too! Does Mike want to come? Good places over there to eat! We will make a night of it. I am buying the book! Which is it? I have tried to win one but to no avail! Sounds fun!! I think Mike would rather get teeth pulled than stand around for 1.5-2 hrs, but he might join us for dinner. It’s her cookbook — The PW Cooks. Great cake! I’m not sure we get quick cooking oats in Australia. We get instant but you say not to use that. Any tips? An BTW it is great that you continue with your ministry, I’m sure the girls will remember this weekend throughout their lives. It would be great if our church held such weekends for the young ones. I teach catechism for half hour but it is never enough – my class has so many questions! Thanks, Marcellina! Another Aussie asked that same question . . . they mentioned Uncle Toby’s ‘traditional’ and ‘quick’ oats, which I think would work. Let me know if you can’t find any — maybe I can ship you some Quaker quick oats! OK. Thanks I’ll try the quick cook oats. This sounds like a really lovely cake. Thanks for the offer too. I’ll let you know how I go. Hello, I just found your site yesterday. This recipe looks amazing and I’d love to try it. ?- can this be done without the tinfoil and still be successful? Also- loved your message. Thank you for sharing and have a blessed Easter! Hi Nicole! Thanks! The tinfoil is so you can neatly retrieve the cake from the pan. If you don’t mind scooping the cake and having it sort of fall apart on the plate (will still taste great! ), you can make this without it! You have a blessed Easter as well!! I saw the recipe of ATK where they made this cake and it looked so good. I’ve wanted to try this ever since so I’m glad you shared the recipe with us. I will make this soon! It seems I’m always lurking around your blog, and have tried a few recipes with amazing results! Hi Cathy! So glad to have you, and so glad you’ve enjoyed the recipes!! God bless you, too! I have looked and looked for this recipe. Made it when I was younger and doing Church Pot Lucks. It was always THE hit and I loved making it. Thanks for helping me find the recipe. You are so welcome! So happy to be helpful.